The World Cup is now in full swing and it is time to start planning for the World Cup Final. With a large choice of World Cup Flags and Bunting as well as World Cup Decorations and Football Themed Tableware there are loads of World Cup Party Ideas for you to enjoy whilst watching this massive event. We would love to know where you will be watching the final and if you always have a tradition of watching with the same people. Which has been your most memorable World Cup Final? Now that the World Cup is well underway it is time to get organised for the World Cup Final which takes place Sunday 13th July. The World Cup Final is an evening game which is ideal for holding a World Cup Themed party. To help you plan for this event, we have loads of World Cup Party Ideas. Having friends over for a barbeque is the perfect way to start. As Brazil are hosting the World Cup 2014 this is a good way to begin theming with World Cup Party Accessories. Brazil Napkins co-ordinated with either the competing teams or Football Plates and Cups are ideal World Cup Themed Tableware to use to entertain your guests. World Cup Decorations such as Football Cutouts and Goal Party Tape help set the tone of the evening and create the feel of being at the World Cup Final. Bunting and Flags are always popular not only for parties at home but for pubs, bars and restaurants to let the public know that they are showing the World Cup Final. 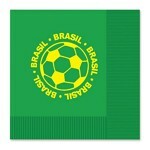 World Cup Qualifying Bunting and Football Flag Bunting are also great additions to the particpating teams. Giving out Hand Held Flags to your guests to wave will increase the fun and atmosphere while cheering on their team. World Cup Finals are always something that people remember and who they were with when they watched each game. Which has been the most memorable Word Cup Final that you have seen? Do you watch a World Cup Final traditionally with the same people?